To be the leading centre in the education and dissemination of Buddha Dhamma. To be the centre of choice for the learning of Buddha Dhamma. 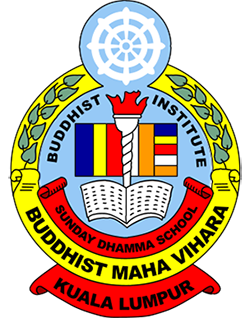 The Buddhist Institute Sunday Dhamma School badge was designed by Mr. Wong Ying Weng and Mr. M. H. Albert. The badge consists of six colours (following the Buddhist Flag) namely: nila (blue), pita (yellow or golden colour), lohita (red), odata (white), manjettha (orange) and pabhassara (the mixture of the above colours). The torch represents the light of wisdom – to dispel the darkness of ignorance. The Buddhist flag in the background is symbolic of the unshakeable spirit and determination of all Buddhists. The Book is the symbol of education. The Buddha himself emphasised the importance of understanding in learning. The aim of the Sunday School is not only to teach and educate but to learn and be educated as well. The blue background is a symbol of confidence – confidence in the Buddha, the Dhamma and the Sangha. To inspire confidence in others, we must have confidence in ourselves. The wheel symbolizes the Noble Eight-Fold Path, in which a confident person could follow to attain full perfection. The motto of the school is “PANNA UDAPADI” which means “Wisdom Appears.” Without the light of Truth there can be no wisdom. To provide students with a comprehensive Buddhist education based on the Pali Canon. To motivate lay people to become Dhamma Teachers by providing training programmes. To provide assistance to other Sunday Dhamma Schools. The unique design was created by Bro. Ng Lid Sine in 1990 and is symbolic of a vibrant, innovative and caring institute, that is able to provide adequate and inspiring guidance to its young. The bright sunshine depicts the rise of a new, fun and sunny day. The lotuses (drawn in an abstract fashion) surrounded by colours of the Buddhist flag conveys purity, innocence and wonder in a warm, fun and friendly environment. 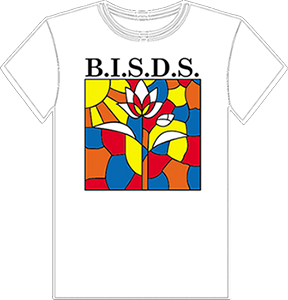 The upright lotus flower in full bloom represents the BISDS staff members who are virtuous in conduct. The slender lotus bud represents the students under the compassionate embrace of their teachers.